Saucony Ride 8 are neutral cushioned running shoes. The Saucony Ride 8 is the new edition from the american brand ready to fight into the competitive market of versatile running shoes with great blend of cushioning and lightweight delivering a good response for long distances. The Ride 8 keeps what works well like the generous cushioning in the full length PowerGrid™ midsole and just 8 mm drop with improved body position on every foot strike for a more natural running. 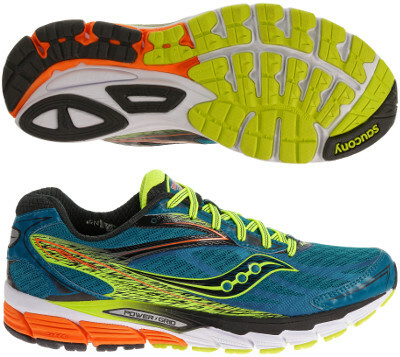 Saucony is trying to turn around the bad reputation for short durability in the upper and the Ride 8 features an all new FlexFilm™ upper following good results seen in other popular models like the Kinvara 6 or the Fastwitch 7 which also enhances fit and breathability without additional weight. Rest of the shoe remains almost unchanged from its predecessor the Ride 7 with particular emphasis on the outsole with strategically placed deeper grooves for considerable flexibility to deliver a smooth transition. iBR+™ rubber in more frequent impact zones assures better response and durability.